If you’re like us, we can’t wait for the return of the 38th edition of the Project Filter Oldies But Goodies Drags. The event is this weekend, Saturday and Sunday, June 2-3. The event is expected to attract racers from six states and Canada. The featured class will be the AA/Supercharged Shootout. The defending champion is Scott White from Seaside, Ore., with this 210 mile per hour 1941 Willys coupe. A multitude of racing classes will be featured at the two-day event. Saturday features time trials and qualifying from 9:30 am until 4 pm. Sunday cash classes (along with full Gold Cup points) include: Super Pro, Pro, Sled/Bike and Sportsman. Saturday afternoon will see racing in Super Pro Gambler, No Box Gambler, Sled/Bike Gambler and the popular Geezer Gambler for the 55 & older jet set. We will also offer racing in: Open Comp, Pro Comp, Gasser, Oldies Bracket #1, Oldies Bracket #2, and Oldies Bracket #3. Host clubs include the: Vintage Gems, Heap Herders, Melba Outlaws, Barons and the Idaho Chariots. A separate show `n shine will be offered each day, so all pre-`89 rides are welcome to come either one or both days of the Oldies weekend. Show parking will be staged in Firebird’s expansive paved upper pro pit area. Best of all, every race and show entry receives a complimentary 2018 Oldies t-shirt, pictured. 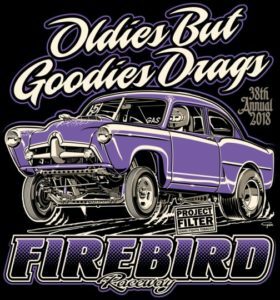 If you own a hot rod, custom, truck, street machine, roadster, dragster, restored or anything else nostalgic or cool, then you’d better start making your plans to join us at Firebird this weekend.